Maryland residents may harvest oysters and clams for recreational purposes. No license is required. Refer to maps of Maryland Shellfish Harvesting Areas for information on areas of restricted waters, closures, and coordinates of sanctuaries online via mde.maryland.gov/programs/marylander/fishandshellfish/pages/shellfishmaps.aspx. You may also call the Maryland Department of the Environment hotline 800-541-1210 to obtain information on conditional closures due to water quality or other environmental issues. Recreational shellfish regulations for the Potomac River can be found at prfc.us. To take oysters or clams for recreational purposes while aboard a vessel where any person is engaged in commercial oystering or clamming. To recreationally harvest oysters or clams within a leased area, harvest reserve area, sanctuary or any other area closed by the state. * However, a nonresident may harvest clams in Worcester County. Monday–Friday: Sunrise to 3 p.m.
Three inches measured from hinge to bill along the longest part of the shell. 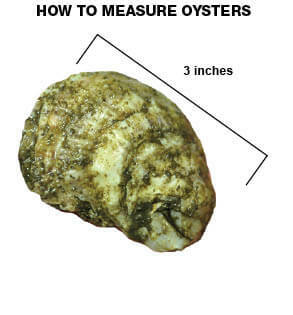 You must determine the size of the oysters prior to leaving the location from which they were caught. Any shell and undersized oysters must be returned to the water before you leave the area. Limited to hand-operated gear only, including hand rakes. Mechanical harvesting is not allowed. The Rangia clam is often found in Maryland in low salinity water. Many of these areas, especially those within 200 feet of shore, have not been tested or approved by the Maryland Department of the Environment for shellfish harvest, and the consumption of these clams is not recommended. 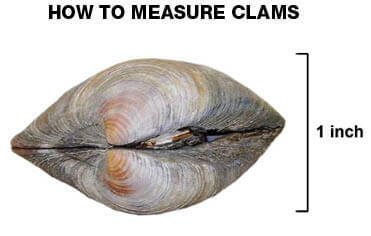 Rangia clams should not be confused with the better-known hard clam found primarily in the Coastal Bays.